In my desire to make healthier menu choices in recent months, I came up with this delicious bean and turkey sausage chili that is low fat, high in fiber, and very filling. I used canned beans in my version simply for convenience sake, but feel free to cook dried beans from scratch if you prefer. You could choose any canned beans you prefer, but I had black, cannellini, and Romano beans in my pantry so I used those. I decided to use Italian style turkey sausages for this recipe just because I love how they taste, but feel free to use ground turkey if you cannot find turkey sausages in your area. 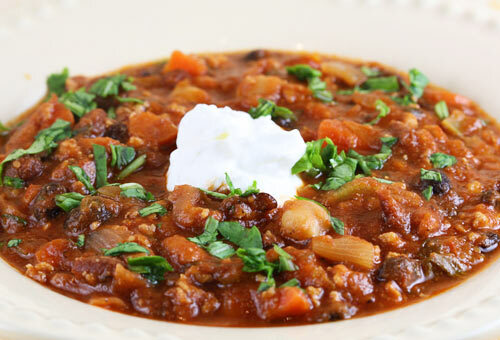 As with most of my soups and stews, I added lots of chopped celery, carrots, and onions into the mix, and of course I also included two chopped hot red peppers in this recipe because we like our chili to have some heat!. To top your chili, feel free to experiment using chopped green onions, or your favorite shredded cheese. I decided to simply add a dollop of fat free Greek yogurt to garnish my stew, although sour cream also works great. 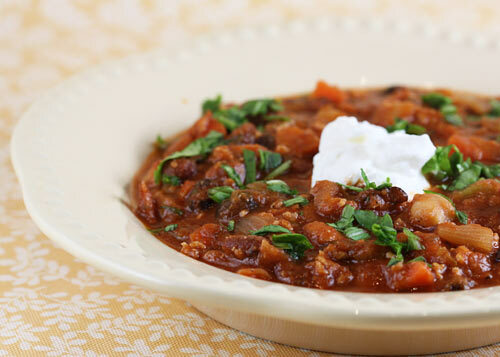 Three different types of beans are combined in this hearty and delicious chili. In a large heavy saucepan, add the olive oil and sausage meat and cook over medium heat until the meat is no longer pink and is beginning to brown. Add the garlic and hot pepper if using and cook an additional minute or two. Add the 3 cans of beans, tomatoes, tomato paste, chicken broth, seasonings and parsley and mix well. Cook until mixture begins to boil, then reduce heat and cook for an additional hour until thick.